Global Himalayan Expedition (GHE) is a social enterprise that seeks to provide clean energy, education and wireless connectivity access through solar power, to help improve the living standards of the rural off grid population. The initiative focuses on implementing a holistic development model for the rural un-electrified mountainous communities by providing energy access through solar micro-grids for the remote villages located in the higher reaches of the Himalayas or any other mountainous regions of the world. Global Himalayan Expedition, till date, has electrified 35 remote Himalayan villages, all located above 12,500ft, through the setting up of 24/48V based DC solar micro-grids. 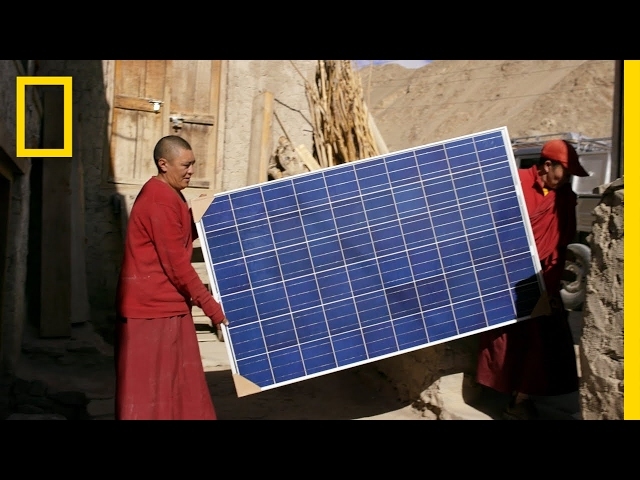 GHE has installed 156 micro-grids providing energy access for almost 930 households across Ladakh and impacting positively on the lives of over 18,000 villagers. This has resulted in 63000 Litres of Kerosene being saved per year from the villages and mitigation of 157 tons of CO2 emissions on annual basis from these villages. This has also resulted in an increase in income of approximately $44,000 across the 25 villages electrified through engagement in tourism. As each micro-grid set-up is community owned, this has generated strong intra community relations among the villagers. GHE has indirectly and directly employed 43 villagers to assist in its expeditions, village surveys and the solar grid installations. Global Himalayan Expedition (GHE) has also been able to train 15 women who are leading home-stay related activities in these electrified villages. Global Himalayan Expedition is focusing on providing basic infrastructure for remote off grid mountainous regions of the world by leveraging Impact Tourism. Once such region where GHE operates is Ladakh ("land of high passes") , located in north India in the state of Jammu and Kashmir (J&K). It is one of the most sparsely populated regions in the world, with its culture and histories are closely related to that of the Tibet region. Ladakh is located at an altitude ranging between 2900m and 5900m. This makes it one of the most elevated and coldest inhabited regions of the world. The winter temperatures drop to as low as -30 Deg C., with most areas becoming inaccessible due to heavy snowfall. The region itself cannot be accessed from October to May as the two main highways connecting the region with the rest of the country get blocked due to heavy snow. The only way to access the region is then by air transport. The region has 250 remote villages most of which do not have access to electricity. These villages lay at an average trek distance of 4-5 days from the nearest motorable roads. Due to the inhospitable terrain, the development of these villages has thus been very limited. There is no mobile connectivity in these villages and very few medical facilities limited to some villages only. All the people living in these villages come below the poverty line and are able to only sustain their basic livelihood from the crops they grow and animals they rear. This type of situation is common across various off grid mountainous communities around the world. Their are currently 915 million people living in mountain areas and almost 50% of them do not have access to either ant kind of electricity or reliable electricity. Based on their rich resources and cultural heritage these areas need to be provided facilities to curb any type of immigration to cities. Our Solution revolves around promoting Impact expeditions to these remote villages and provide energy access. The energy Access is provided through Low Power DC solar microgrids. Our DC solar micro-grid technological solution is an efficient solar system design for decentralized power generation as it involves no DC to AC conversion losses. The capacity of these micro-grids ranges from 150W to 250W. To support this technology, GHE has designed its own DC LED Lights. These are energy efficient LED Lights and provide 320 Lumens of light from just 2.5W of power. GHE has also designed its own low power DC High Definition LED TV and DC LED Street Lights at 20W to support the low power micro-grid solution. From a single 250W microgrid solution, GHE is able to electrify 5 Households with a total of 30 LED Lights, 3 LED HD TV’s, 2 LED Street Lights, 8 in 1 DC USB charging Hub. By combing tourism activities with energy access, we are able to create livelihood opportunities for villagers and help boost the economy of the local region. This in turn provides revenue to our local service centre and creates multiple revenue streams for us. Provides modern energy access to 930 households. Reduces greenhouse gas emissions by 63 Tonnes of Carbon Dioxide per year. Creates 124 new jobs during the lifetime on the project. Improves the health conditions of 18,000 people. Out of the total number of beneficiaries of the project, 4,000 are women. Setup eight (8) Training Centres on pashmina weaving for the local women in association with the local government. Currently 200 women are being trained in these digital livelihood centers. Set up six (6) Solar DC Grid based Education Centres promoting experiential education and developing understanding around sustainability themes in various villages schools, impacting 4000 students. GHE has to date electrified 35 villages with 156 microgrids impacting the lives of 18000 villagers, saving 157 tons of Kerosene till date. GHE has introduced a low power computing platform which allows users to run DC based computers on low voltages as low as 5V. The computing platform consumes less than 5W of power and if combined with DC LED TV screen (21 inches), keyboard and mouse, the total power consumed is less than 27 Watts of power. Our 250W DC micro-grid can powerup seven (7) computer setups in a school Lab. This setup also demonstrates energy efficiency for promoting Digital E=education and powered by a DC circuit. The image attached depicts the components of a typical lab setup, including satellite based internet. To monitor and control these microgrids from a remote location, GHE is also working on a IoT based setup on extended Wi-fi to help digitize the microgrid data from the villages. GHE also designs low power DC appliances that can enable a community to meet their aspirational loads. GHE feels that energy efficiency is the key to providing sustainable energy access to the remote communities. keeping that view in mind, GHE's R&D team has designed its own low LED lights, LED street Lights, BLDC fans, DC LED TV, DC Computers and DC grinders. We are also making converters that enable these devices to run on any LVDC voltage.